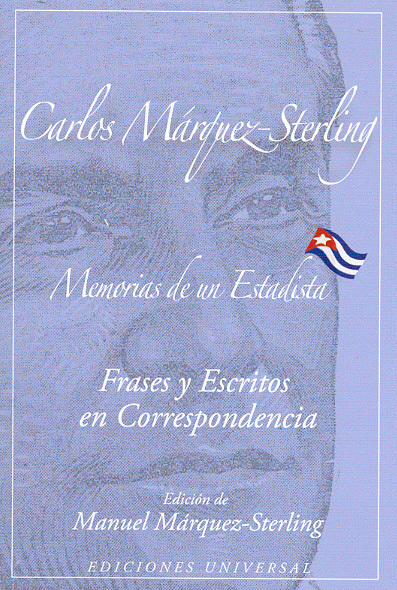 Carlos Márquez-Sterling, Memorias de un estadista: Frases y escritos en correspondencia, edited by Manuel Márquez-Sterling. Carlos Márquez-Sterling was one of the most prominent figures of 20th Century Cuban political history. The book presents a portrait of this extraordinary man through his correspondence and personal papers edited by his son, historian Dr. Manuel Márquez-Sterling. At the book presentation, Dr. Márquez-Sterling will be joined by Dr. Néstor Carbonell Cortina, a Cuban constitutional law expert, and Dr. Uva de Aragón, Associate Director of the Cuban Research Institute at Florida International University. They will share their personal memoirs and thoughts about this remarkable man and his legacy. Roberto C. Goizueta Pavilion, Otto G. Richter Library, 6 p.m.